Branded Housewares Limited are the foremost UK based wholesaler, returns agent and exporter of home electrical products and housewares. Successfully trading for many years and specialising in the selling and distribution of top quality branded goods at extremely competitive prices. Whether you are a wholesaler looking to buy in bulk or an independent retailer purchasing on a smaller scale our dedicated sales team will be available to assist you to make the right choices. We stock a large range of quality brands in electrical appliances and housewares from many of the world's top manufacturers. Everything from larger appliances such as microwaves and fridge freezers, washing machines, juicers, blenders, kettles, fryers, mixers, steam irons, food processors etc. Our aim is to offer high quality stock at unbeatable prices. Top brands such as Breville, Morphy Richards, Russell Hobbs, Hoover, Anchor Hocking, Remington, Nicky Clarke, Bosch, Daewoo, Andrew James, Bergner, Salter, Homedics, Character World, Laura Ashley, Burco, Nilfisk, Lloytron, Gtech, Dimplex, Wahl, Batavia, Einhell and Candlelight are just some of the companies that we deal with on a regular basis. For most of the above companies, we are their preferred route to specific markets as we are able to control the distribution of their bulk returns stock and ex-catalogue products into the correct channels of distribution which avoids any unnecessary complications for our suppliers. We have worked with these companies for many years but are always seeking new products to sell across the UK, Europe, the Middle East and Africa. We sell a vast range of electrical products, home appliances, kitchenware, cookware,tableware, power tools etc. Including kettles, irons, grills, blenders, juicers, food mixers, fryers, vacuums, rice cookers, slow cookers, toasters, fridges freezers, heaters, radiators, cooling fans, steam mops, microwave ovens, petrol and electric power tools, hair care appliances, pressure washers and jet washers etc. Many of these are customer returns, returns pallets, bulk stock, overstock, job lots, ex-catalogue, wholesale lots, wholesale stock, clearance, rejected stock, refurbished, reconditioned, graded, surplus stock as well as new stock. We have approximately 100,000 square foot of product storage space centrally located in Wolverhampton in the West Midlands. Our location is within easy reach from the motorway for customers in the UK and only a 40 minute drive from Birmingham International Airport for our overseas customers. Fully racked to accommodate over 2000 pallets of stock we are currently at an advanced stage of computerising stock control. Our experienced and dedicated staff has the use of advanced materials handling equipment in order to facilitate the flow of stock throughout the warehouse and to expedite the loading and unloading of containers. Branded Housewares Limited are a family owned, self-financing company with no borrowings and as such are able to complete deals quickly and efficiently. Along with our UK trade, we export goods all over the World. We are always looking for new customers worldwide and to form a long and mutually successful business relationships. Africa - Algeria, Angola, Cameroon, Congo, Cote d'Ivoire (Ivory Coast), Egypt, Gambia, Gabon, Ghana, Guinea, Kenya, Morocco, Nigeria, Tanzania, Tunisia and Uganda. 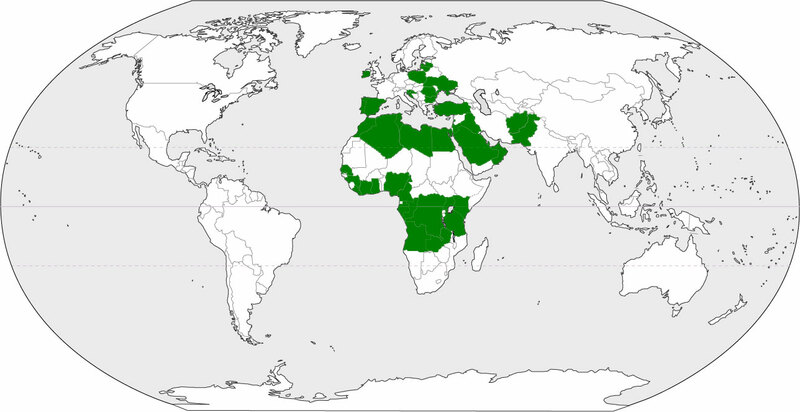 Middle East - Afghanistan, Iraq, Jordan, Lebanon, Oman, Pakistan, Turkey and UAE (United Arab Emirates). Eastern Europe - Bulgaria, Latvia, Lithuania, Poland, Romania and Ukraine. Registered in England and Wales at Branded Housewares Limited, 106 Tettenhall Road, Highfield, Wolverhampton, West Midlands, WV6 0BW. VAT Registration Number: GB 889562454.